Modular Tidal Generators Limited have designed a system using existing technology in a new and novel way to produce green energy from fast flowing rivers and tidal flows. 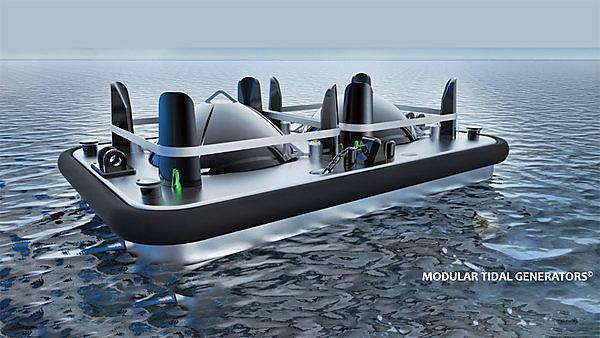 The system is modular comprising a floating barge platform fitted with a number of removable turbine modules. Each turbine is fitted with a propeller turned by the tidal flow thus creating electrical power. The turbine modules can be installed into the barge and removed for maintenance ashore in minutes making service simple and inexpensive. A consortium of partners including MTG Ltd., A&P Group, Mojo Maritime and the University of Plymouth are assisting in the production engineering, design, turbine integration and hydrodynamic analysis to get the design from concept to deployment. The barges and modules will be built in the UK benefitting the UK economy providing employment and substantial exports. The system is carbon free providing a low cost, sustainable secure source of electricity. The overall aim of the MTG1 project is to develop an open-source, efficient and sustainable, numerical tool for assessing complete floating tidal stream systems in real conditions and provide a proof of concept for the MTG tidal raft platform design. To identify appropriate UK deployment sites and define specific environmental test cases, based on these, to assess the MTG concept. Produce engineering designs for the hull form concept, turbine integration and mooring system. Generate the necessary software to allow for simulation of the complete tidal raft platform concept. Use the developed code to simulate the MTG concept in the specified environmental test cases and provide feedback on design decisions. Figure 1: Screenshot from simulation of the MTG platform raft concept.